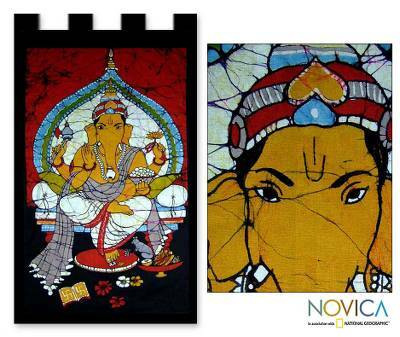 Batik Cotton Wall Hanging with Hinduism Theme, "Benevolent Ganesha"
Working in batik, Siddique creates a wonderfully detailed portrait of Ganesha. He is the son of Shiva and Parvati, two of the most powerful deities within the realm of Hindu belief. Ganesha is endowed with the power to control the occult forces that bring disaster upon humankind. His clothing and posture evoke a sense of nobility while his face speaks of kindness and generosity. "Looking at my father's dedication towards his work greatly inspires me. Most importantly, to inherit his talent would be a great honor." "Hello, I'm Siddique from Madhya Pradesh. I come from a beautiful city with great historic places as well as an exquisite arts and crafts heritage. 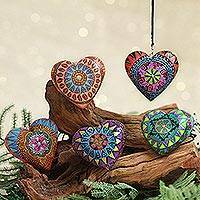 Madhya Pradesh in general is rich in varied arts and crafts such as batik, painting, wood carvings, tribal painting etc., and I specialize in batik prints. "My family has been in this tradition for many years now. In fact, my father is one of the pioneers in batik work and I feel fortunate to inherit this art. Besides batik, my father also specializes in kalamkari, screen printing, and block printing. My father is a great craftsman and has always been keen to explore other artistic venues. He is a very humble man who never does his work for money, but for the sheer commitment toward his craft. "Our financial condition was not very good and so, contrary to my father's wishes, I tried to pursue a career in banking after completing a Masters in Commerce. However, luck did not favor me and I did not get through the test in banks. Not being able to pursue my dream got me thinking that even if my father had not earned much money, he was content with his life because he thoroughly enjoyed what he was doing. I thought maybe I should follow suit and find something that fulfilled me. I already knew the art of batik, which I had learned from my father, so I decided to work dedicatedly alongside my father. "Together, we have exhibited our works in different parts of the country including Mumbai, Chennai, Bangalore, Hydrabad, Delhi and Bhopal. Looking at my father's dedication towards his work greatly inspires me. Most importantly, to inherit his talent would be a great honor. After my father retires, I would want people to recognize our work as his, and this will be a great achievement. My father has also been honored with two State Awards in batik and block print in the early 1980s." I ordered the Batik ""Dancing Shiva"" Tapestry and it is absolutely gorgeous! The coloring and quality are superb! I receive compliments on it all the time. I will definitely purchase more pieces from this artist. Siddique is truly talented. I ordered 2 ""Graceful Ganesha"" wall hangings. The colors and quality of his work are stunning. When I opened the mailer, the package inside was beautiful-wrapped in lovely paper and embroidered ribbon. He gave it a personal touch by including a hand-written note on a beautiful postcard of the Taj Mahal, in two languages, with a thank you. The hall hangings are absolutely beautiful. I gave one as a gift. My friend and I opened the package together and we were both speechless. Siddique has a creative gift that comes from the heart. Thank you.